In anatomy, a ligament is a band or sheet of strong fibrous connective tissue that connects bones to other bones, or to cartilage, or supports an organ, such as the spleen, uterus, or eyeball. Such structures tend to be somewhat flexible but inelastic. They differ from tendons in that tendons extend skeletal muscles to their attachments. There are three basic types of structures referred to as ligaments. Those known as articular ligaments, fibrous ligaments, or "true ligaments," connect bones to other bones, such as the anterior cruciate ligament (ACL) that connects the posterio-lateral part of the femur to an anterio-medial part of the tibia. The term ligament also is used to denote a fold of peritoneum or other membrane that connects to organs, such as the broad ligament of the uterus, which is a wide fold of peritoneum that connects the sides of the uterus to the walls and floor of the pelvis. In addition, ligament is used to refer to remnants of a tubular structure from the fetal period of life, such as the medial umbilical ligament, which is found on anterior abdominal wall and represents the remnant of the fetal umbilical arteries, but which serves no purpose in humans after birth and is shriveled in adults. 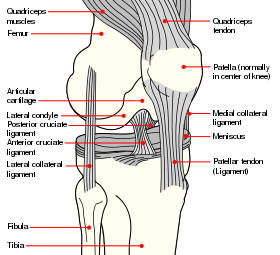 The importance of ligaments, and the harmony with which they normally integrate with the bones and organs of the body, is seen when a ligament become broken, such as when the ACL of the knee is torn during sudden dislocation, torsion, or hyperextension in sports such as basketball or football. Various surgical procedures have been developed to repair broken ligaments. This article will only briefly review these later two types of ligaments, with the article mainly focusing on the first meaning, which is what is most commonly meant by the term ligament. The study of ligaments is known as desmology, from the Greek desmos (δεσμός), meaning "string," and -logia (-λογία), meaning "study of." Certain folds of peritoneum are referred to as ligaments. Peritoneum is the serous membrane that forms the lining of the abdominal cavity, covering most of the intra-abdominal organs. The serous membrane has a connective tissue layer that provides the blood vessels and nerves for the overlying secretory cells, and also serves as the binding layer that allows the whole serous membrane to adhere to organs and other structures. Dorland (2007) notes that one meaning of ligament is "a double layer of peritoneum extending from one visceral organ to another." Examples include of this use of ligament include the hepatoduodenal ligament, which surrounds the hepatic portal vein and other vessels as they travel from the duodenum to the liver. The broad ligament of the uterus is also a fold of peritoneum. 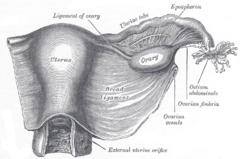 The broad ligament of the uterus is the wide fold of peritoneum that connects the sides of the uterus to the walls and floor of the pelvis. Another such type of ligament is the suspensory ligament of the ovary, which is one continuous tissue that connects the ovary to the wall of the pelvis. Some sources consider it a part of the broad ligament of uterus. Certain tubular structures from the fetal period are referred to as ligaments after they close up and turn into cord-like structures, which are nonfunctional after birth (Dorland 2007). For example, the ligamentum arteriosum (or arterial ligament) is a small such "ligament" attached to the superior surface of the pulmonary trunk and the inferior surface of the aortic arch. It is a nonfunctional vestige of the ductus arteriosus, and is formed within three weeks of birth. The ligamentum teres hepatis (the "round ligament of the liver") represents the remnant of the fetal umbilical vein. The ligamentum venosum is the fibrous remnant of the ductus venosus of the fetal circulation. Usually, it is attached to the left branch of the portal vein within the porta hepatis of the liver. The medial umbilical ligaments represent the remnant of the fetal umbilical arteries. Diagrammatic section of a symphysis. In its most common use, a ligament is a short band of tough, fibrous, dense, regular connective tissue composed mainly of long, stringy collagen fiber. Such bands of fibrous tissue connect bones or cartilages, serving to strength and support the joints (Dorland 2007). Typically, they connect bones to other bones to form a joint, with the ends or edges of the ligaments connected to the relevant bones (Judge 2001). They do not connect muscles to bones; that is the function of tendons (Judge 2001). Some ligaments limit the mobility of articulations, or prevent certain movements altogether. Capsular ligaments are part of the articular capsule that surrounds synovial joints. They act as mechanical reinforcements, with the ligaments forming a cuff or "capsule," along with additional strengthing bands, such as spanning the sides of the knee (Judge 2001). Extra-capsular ligaments join bones together and provide joint stability, such as the cruciate ligaments that join the tibia and the femur in the knee joint (Judge 2001). An example of an articular ligament is the medial collateral ligament (MCL) of the knee, one of the four major ligaments of the knee. It is on the medial (inner) side of the knee joint in humans and other primates. It is a broad, flat, membranous band, situated slightly posterior on the medial side of the knee joint, and is attached proximally to the medial condyle of the femur immediately below the adductor tubercle. It resists forces that would push the knee medially, which would otherwise produce valgus deformity. The posterior sacroiliac ligament is situated in a deep depression between the sacrum and ilium behind; it is strong and forms the chief bond of union between the bones. The radial collateral carpal ligament of the wrist attaches to the styloid process of the radius and the radial side of the scaphoid bone. The palmar radiocarpal ligament (anterior ligament, volar radiocarpal ligament) is attached above to the anterior margin of the lower end of the radius, to its styloid process, and to the front of the lower end of the ulna; its fibers pass downward and medialward to be inserted into the volar surfaces of the scaphoid, lunate, and triangular bones. Ligaments are somewhat elastic; when under tension, they gradually lengthen. (This is in contrast to tendons, which are inelastic). This is one reason why dislocated joints must be set as quickly as possible: If the ligaments lengthen too much, then the joint will be weakened, becoming prone to future dislocations. Athletes, gymnasts, dancers, and martial artists perform stretching exercises to lengthen their ligaments, making their joints more supple. The term double-jointed refers to people who have more elastic ligaments, allowing their joints to stretch and contort further. The medical term for describing such double-jointed persons is hyperlaxity and double-jointed is a synonym of hyperlax. The consequence of a broken ligament can be instability of the joint. Not all broken ligaments need surgery, but if surgery is needed to stabilize the joint, the broken ligament can be joined. Scar tissue may prevent this. If it is not possible to fix the broken ligament, other procedures such as the Brunelli Procedure can correct the instability. The Brunelli Procedure is a surgical procedure that can be used to correct instability in the wrist, such as by a torn Scapholunate ligament. The Brunelli Procedure does not fix the torn ligament. A hole is drilled through the Scaphoid bone and a part of a tendon taken from the patient is put through this hole and attached to the nearby bones. Instability of a joint can over time lead to wear of the cartilage and eventually to osteoarthritis. The Broström operation is another surgical procedure. It involves repair of damaged ligaments on the outer ("lateral") side of the ankle, designed to address ankle instability (Bell et al. 2006). Bell, S. J., T. S. Mologne, D. F. Sitler, and J. S. Cox. 2006. Twenty-six-year results after Broström procedure for chronic lateral ankle instability. American Journal of Sports Medicine 34(6): 975–8. PMID 16399935. Retrieved February 16, 2009. Judge, S. 2001. Ligament. In C. Blakemore and S. Jennett. 2001. The Oxford Companion to the Body. New York: Oxford University Press. ISBN 019852403X. Daniel, D. M., W. H. Akeson, and J. J. O'Connor. 1990. Knee Ligaments: Structure, Function, Injury, and Repair. New York: Raven Press. ISBN 0881676055. Dorland, W. A. N. 2007. Ligament. Dorland's Illustrated Medical Dictionary. Edinburgh: Elsevier Saunders. ISBN 9781416023647. This page was last modified on 17 February 2009, at 14:23.